The anticipated return of Robyn to Vancouver definitely didn’t leave anyone dancing on their own. The Swedish pop star brought her fans out to Pacific Coliseum, moved from PNE Forum due to demand. From the first strains of Honey to the last of Who Do You Love? Robyn filled the 90 minutes in between with the fun pop she’s known for. With her last visit to Vancouver being in 2010 her fans have been waiting a long time for another chance to dance and sing along to her tunes. Dressed in white and singing from white set stage the singer presented a muse-like ethereal figure. Robyn was certainly a muse for the thousands in attendance as the energy and excitement built throughout the set. After a costume change the red hot singer brought the show a crescendo as the set drew on, the whole audience singing along to Dancing On My Own was certainly a moment to remember. Following up with Missing U and Call Your Girlfriend to close out the main set, the audience craved more. Robyn delivered with more songs in the encore leaving fans to dance their way out of the Coliseum into the night. Robyn The Honey Tour continues around North America through March before returning to Europe for the rest of spring and summer. The 10-time Grammy Award winning artist, Bobby McFerrin is coming to the The Chan Centre for the Performing Arts at the University of British Columbia on February 17, 2019. The genre-defying artist is joined by Gimme5; McFerrin’s newest band comprised of veterans from his a cappella Voicestra group Joey Blake, Dave Worm, Rhiannon, and Judi Vinar, as well local choral ensemble musica intima is on the bill. The concert supports Bobby McFerrin’s current Circlesongs tour centred on an Circlesinging, and improvised concert format based on McFerrin’s sweeping, soulful vocal language —a style encompassing elements from all genres including jazz, pop, R&B, classical, and world music. Requiring an innate sensitivity to surrounding participants the style results in a unique and spontaneous sound. Joined by the Vancouver-based eight-member choral group musica intima, McFerrin and Gimme5 will present an evening of sound that draws in the audience as co-performers. McFerrin was born to classically trained singers and into a world of music that took him from New York to Hollywood. His father, Robert McFerrin Sr., was the first African-American male to sing at the Metropolitan Opera and provided the on-screen singing voice of Sidney Poitier in the 1959 film Porgy and Bess. The younger McFerrin grew up playing piano and clarinet, surrounded by a hodgepodge of genres that ranged from Duke Ellington to George Gershwin, James Brown to Led Zeppelin. It wasn’t until he turned 27 that he discovered a passion for singing — as well as an impressive range and the uncanny ability to transform his voice. As NPR noted: “Listen to Bobby McFerrin and it’s like you’re listening to an entire orchestra bubbling up through one man’s body. He becomes a flute, a violin, a muted trumpet, a percussion instrument, a bird, you name it.” The popularity and accolades of 1988’s “Don’t Worry, Be Happy” brought McFerrin worldwide attention and he has been collaborating, recording and touring ever since. Performing with orchestra’s across the world, and artists like; Chick Corea, Herbie Hancock, Yo-Yo Ma, Dizzy Gillespie, and more. Join Bobby McFerrin, Gimme5 and musica intima for the spontaneous Circlesongs performance in the Chan Shun Concert Hall at Chan Centre for Performing Arts at UBC on February 17, 2019 at 7pm. Music on Main invites you to immerse yourself in the 2018 Modulus Festival from November 2 – 6, 2018. Acclaimed music and sounds will fill The Roundhouse, The Post at 750 and CBC Studio 700 over the five day festival. A collaborative festival, Modulus brings together other Arts organizations from near and far to mount the series of great events. DOXA, Coastal Jazz, Western Front Music, Standing Wave, NOW Society, Driftwood Percussion, Montreal’s Suoni Per Il Popolo, France’s Ensemble Variances and Britain’s Huddersfield Contemporary Music Festival all contribute to Modulus. Evening and afternoon performances bring concerts, talks, films and even a kitchen party to the stages. Covering jazz, percussion, classical, chamber music and more, featured events include a night of music and video with acclaimed pianist Eve Egoyan including Nicole Lizée’s “glitch” inspired piece David Lynch Etudes, a world premiere by Nicole Lizée performed by flutist Claire Marchand and harpist Albertina Chan, composer and vocalist Laura Bowler. Modulus Festival begins Friday, November 2 at 8pm running to Tuesday, November 6, 2018 at The Roundhouse, The Post at 750 and CBC Studio 700. Events are free and/or ticketed, visit musiconmain.ca for more details and to purchase tickets. Last night Chor Leoni’s Mane Event at Bard on the Beach filled the mainstage tent with the sounds of music. The perfect way to wrap up the Canada Day weekend, the Lions brought to stage a varied selection of songs including a taste of Canadiana including iconic hits by Tragically Hip, Ian & Sylvia Tyson along with Quebecois and Maritime folk faves and the touching Gimikwenden Ina from the Indigenous musical Children of God. In the second act, the men of Chor Leoni really let loose and ramp up the fun with the pop and Broadway hits. Rob McAllister’s colourful costumes add to the comedic flare pop and Broadway hits. Even Bollywood makes a showing too, really highlighting Ariana Barer’s choreography. Meghan Trainor’s Me Too, a Lady Gaga/Madonna mash-up Born To Express Yourself This Way, and Justin Timberlake’s Can’t Stop The Feeling brings out the Trolls (not the internet type), to wrap up the feel good show. See As You Like It or Timon of Athens* followed by a salmon barbecue from Emelle’s Catering. Visit the PIXSTAR Photobooth, take in the award-winning Dowco Triumph Street Pipe Band and more, before enjoying a private view of the spectacular Celebration of Light fireworks. A perfect night for the whole family! Geared for ages 6 and up, this special evening is filled with family-friendly activities. Arrive at the Village early for the PIXSTAR Photobooth, face painting, food truck, an exclusive pre-show talk designed just for kids and more. Then enjoy a performance of the Bard/Beatles musical-comedy mash-up As You Like It. Join the UBC Opera Ensemble and members of the Vancouver Opera Orchestra for a costumed concert performance. Drawn from a set of best-loved operas, the programme will include favourite selections from La Traviata, La Bohème, Die Fledermausand more. Bard Artistic Director Christopher Gaze hosts all performances, presented on the BMO Mainstage. As Bard On The Beach gets underway, Chor Leoni is also readying for its 25th, and final, season performing under the tents at Vanier Park with a new show Mane Event. Mane Event blends the old with the new, folk songs with Broadway, and funk with power ballads in a program guaranteed to thrill you. At their very first Bard performance, in 1993, the men’s choir premiered a mash-up arrangement by Miles Ramsay that merged Cole Porter’s So In Love with Leonard Bernstein’s Tonight from Westside Story. For their 25th anniversary this beloved gem returns, along with other favourites culled from their repertoire from years past, including The Impossible Dream, Canadiana Medley, Into the West, and the tongue-twisting Trinque L’amourette. The production isn’t just about looking back at their past, it will include new arrangements including Van Morrison’s Brown Eyed Girl, Peter Gabriel’s In Your Eyes, Try Everything (sung by Shakira in Zootopia), and a high-energy Lady Gaga/Madonna mash up. Mane Event is the choir’s opportunity to shake out their manes for their 25th and final production at Vancouver’s favourite summer venue. Expect familiar tunes, mind-boggling choreography, over-the-top costumes, and a crackerjack band as the lions close out their season with a wink and a roar. Add in amazing choreography, fantastic costumes, and a crackerjack band led by Ken Cormier and it’s clear this more than just a concert. Chor Leoni Men’s Choir (“choir of lions”) is recognized as one of North America’s premiere ensembles and performs to over 15,000 patrons each year. A local treasure, the choir has been voted Best Local Classical Vocal Ensemble four years in a row by the Georgia Straight readership, and Best Choir in the WestEnder’s Best of City 2017 poll. Once again, each night at 8:30pm the Pacific National Exhibition will come alive with the sounds of music, and this morning is your chance to get tickets to the summer’s best entertainment value, the 2018 PNE Summer Night Concerts series. 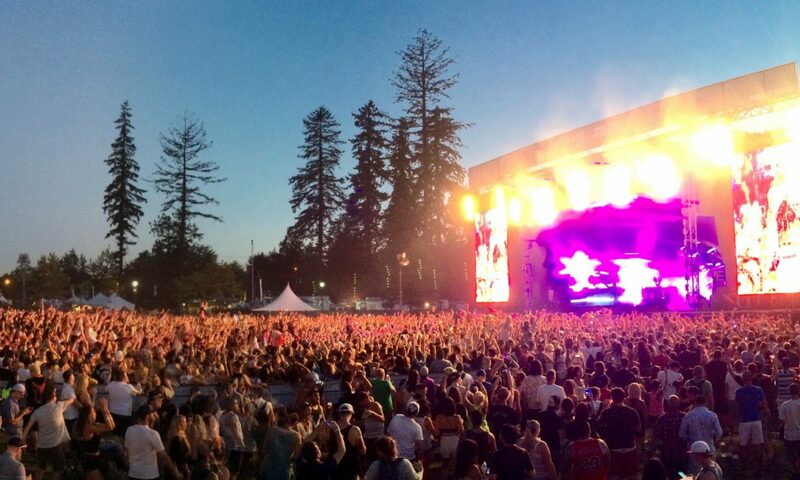 Pop, rock, country, disco, soul and R&B all come to the PNE Amphitheatre stage throughout the 15 Summer Night Concerts. You can take it way back with the likes of Kool & the Gang, Wilson Phillips or Air Supply. Feel like a kid again with I Love The 90s or Lost 80s ensemble nights. Then rock out with Goo Goo Dolls and Marianas Trench. The 2018 Summer Night Concerts are included free with admission but be aware that seating is first come-first seated so you’ll want to make sure you arrive early. Beer Gardens around the PNE also show the concerts on big screens so you can still enjoy the shows even if the Amphitheatre is already at capacity. If you don’t want to wait, limited reserved seating is available from $25 + admission. Reserved seats go on sale today, May 25, 2018 at 10am. In addition you can gather your friends and family to reserve a private party suites that cater to groups of 12 or 14 including the private suite, gate passes, concert tickets, food & beverage service, plus parking passes. Get your tickets online at PNE now. From the opening notes of the overture to the final sing-along curtain call, Mamma Mia now play at The Arts Club Theatre Company Stanley Industrial Alliance Stage, will have you dancing in your seat. The feel-good jukebox musical inspired by the hit music of Abba is composed by Abba’s Benny Andersson and Björn Ulvaeus and written by Catherine Johnson with this production directed and choreographed by Valerie Easton. Set Designer David Roberts’ beautiful set transports the audience to the beaches and tavernas on the fictional Greek Island of Kalokairi. Mamma Mia opens as Sophie Sheridan (Michelle Bardach) prepares for her wedding to fiancé Sky. Raised by single mother, innkeeper, Donna, Sophie seeks to know who her father is and discovering her mom’s diary she discovers three possible fathers. Inviting all three, Sam, Bill and Harry, to her wedding unbeknownst to Donna, with none of them, other than Sophie, really sure why they are all on the island, all sorts of miscommunication comedy ensues. Donna is supported by her two long time girlfriends and former girl-group bandmates, Rosie and Tanya. Throughout the 2 hour musical the story of love, female empowerment, and friendship is perfectly woven into the familiar Abba songs. Amongst the solid storytelling, some numbers are just for the sheer fun of it, enter Donna and the Dynamos who’s camp costumes takes the audience back to the heyday of the Swedish quartet. The Dynamos, Rosie and Tanya, are played with just the right blend of slapstick and camp by Cathy Wilmot and Irene Karas Loeper (respectively), while Stephanie Roth brings a perfect balance of power and emotion to Donna’s vocals. With Ms Bardach vocally matching Roth’s, the two leading ladies anchor Mamma Mia with the grace and strength. Among the male leads Michael Torontow as Sam, stands out with a strong voice and leading man charisma. Local theatre veterans, Warren Kimmel as Aussie Bill and Jay Hindle as Harry, while not carrying as much of a musical load, bring a nice blend of comedy and fatherly friendship to their roles, in spite of Hindle’s distractingly wavering British accent. While there appeared to be a couple prop and wardrobe slips on opening night, not surprising in such a physically challenging song and dance production, the veteran cast improvised their recovery with seamless ease. The overall spirit of Mamma Mia and the joyous Abba music is sure to win over even the hardest demeanour with smiles and laughs throughout the show, especially during the rousing encore as the company (and many audience members) reprise Mamma Mia, Dancing Queen and Waterloo. Mamma Mia plays at the Stanley Industrial Alliance Theatre until August 12th, with special sing-along performances on July 28th. Visit artsclub.com for showtimes and tickets.